The human spirit connects us with each other, regardless of natural or man-made borders, regardless of the passage of time . . .
Culture endures over the millennia. This was such a profound discovery. I would have never thought of that, none of us would have. Razija told us that the Ladino language had been kept by her family, for generations, hundreds of years. She was a descendant of Sephardic Jews who had left Spain at the end of the 15th century and spread around the world, carrying their culture, their language and their music with them. As we were discussing and researching this in the years that followed, my wife found out that her last names, Moliner and Ferrer, were names that the Jewish people in Spain at that time took from their professions (Moliner=miller, Ferrer=blacksmith) in order to convert to Christianity and stay in Spain. Many years later we found ourselves looking for music from our native countries. Our friend Sérgio Assad suggested that we explore our native folk music, and then it all felled into place like a perfect puzzle. It had to be Sephardic music. It was in my family back in Bosnia, and it is in my family with my wife here and now. And it has been waiting to inspire modern composers and musicians alike. It is here to stay. I had a dream almost twenty years ago . . . and imagined music that Denis and I would play. Music based on the beautiful Sephardic melodies rooted in my native Spain more than five centuries ago . . . This dream needed to come true. Today I'm very excited about that our Sephardic Project is moving forward. The works will be new compositions, not arrangements, based on early Sephardic melodies in the way that Bartók, for example, used Hungarian folk music in his own compositions. We chose these composers because we have already worked with all of them. Each brings an interesting new approach to composition, and they come from a variety of backgrounds and styles: jazz, Brazilian, Cuban-Latin, modern, etc., and that eclectic feel we get from them is what makes their music so appealing. We have commissioned music from five wonderful composers, Clarice Assad, David Leisner, Carlos Rafael Rivera, Alan Thomas and Joseph V. Williams II. One piece for Flute and Guitar duo, as well as two Sextets with Flute & Guitar & String Quartet and two trios, one with Cello, Flute and Guitar and other with Violin, Alto Flute and Guitar respectively. We thank those who help the dream all along: Aunt Razija; Sérgio for always giving us the best ideas; Jim Ginsburg, Cedille Record’s visionary president, for believing in us and agreeing to record and distribute these works worldwide, and Tom Baron, Mark Cavalenes and Howard Rossman for making this possible with their generous gifts. I kept the dream, like our ancestors kept the language, the traditions, and the culture. The Avalon Quartet as well as Desiree Ruhstrat and David Cunliffe, from the Lincoln Trio are collaborating with us. The World premier will be held at the Ravinia Festival, March 12th 2016. Isabel was commissioned by Austin Classical Guitar and is dedicated to the Cavatina Duo. At their request, I drew inspiration from the Sephardic Jews who lived in Spain up until the 16th Century. This piece pays tribute to the tragic history of Isabel de los Olives y López and her persecution during the Spanish Inquisition. It draws from the Sephardic folk song Durme, durme mi linda donzella and bears witness to her struggle. Sleep without pain nor sorrow. Hear me sing my grief, beautiful. Like many other composers, I have often looked to what is called “folk music” for inspiration and musical ideas. I was therefore delighted when the Cavatina Duo commissioned me to write a substantial piece drawing on the music of the Sephardic Jews—i.e. the Jewish ethnic group which emerged as a distinct community in the Iberian peninsula around the start of the second millennium. Though none of the melodies today known as "Sephardic music" can be traced back to the Jews in Spain prior to their expulsion from that country in 1492, nonetheless over the subsequent centuries a beautiful repertoire of song has grown from the experience of the Spehardic Jews as they migrated and settled throughout the Mediterranean, North Africa and the Balkans. As they did so, they adapted their Ladino (Judeo-Spanish language) song texts to the musical styles and melodies of their new cultures, and therefore what we know as Sephardic music today is a rich mixture of musical styles found in Morocco, Turkey, the Balkans and many other countries. As with all folk music, the Sephardic repertoire was in a constant state of transformation, and indeed has only become relatively fixed since a number of important transcriptions were published in the 1950's and 60's and the melodies were taken up and recorded by early music groups and world music singers in recent decades. My Trío Sefardí for flute, cello and guitar is in three movements, with each movement employing one melody from the Sephardic repertoire for its musical material. The first movement is based on the song "Ya viene el cativo" (“Here comes the slave”), the lyrics of which involve a slave girl’s lament in memory of her homeland. Apart from the emotional content of the lyrics, what particularly attracted me to this song was the symmetrical intervallic properties of the song’s opening melody, which consists of three chromatic notes surrounded by a minor third on both sides. I am fascinated by such symmetries in music, and by the possibilities they open up for development in different harmonic contexts and in permutations of the intervallic pattern (inverted, reversed, re-ordered, expanded/contracted etc.). While this movement might best be described as a set of linked and continuous variations, several main formal sections can be delineated: slow and lyrical in the initial presentation and variation of the Sephardic melody, leading to an energetic scherzo, following which the theme is modified in a slow major key version and finally a fast fugue. The second movement uses the melody "Yo m'enamori d'un aire d’una mujer", which might be best translated as “I fell in love with the scent of a woman”. The lyrics of the song speak of intoxicating emotions and the dangers of a moonlit encounter with a beautiful woman, and the title put me immediately in mind of the Al Pacino film “The Scent of a Woman” and the tango danced in that film. With this tango connection in mind, converting the melody from 3/4 time to 4/4 and setting it for the sultry voice of the alto flute seemed the ideal way to approach this beautiful Sephardic song. The third movement is based on the melody "Una matica de ruda"—in English “A sprig of Rue” (“rue” being a type of herb native to the Balkan peninsula as well as the more common usage as a synonym for “regret”). In addition to being attracted to these multiple meanings, I was immediately drawn to the song’s lyrics, which take the form of a dialogue between a mother and daughter. The daughter tells her mother that a young man is in love with her and has given her a bouquet of rue. The mother warns the daughter to not sacrifice her virtue to young love, and that a bad husband is better than a new lover. It is the daughter’s perfect and poetic reply though that makes the song: “A bad husband, my mother? There is nothing worse. But a new lover, my mother? the apple and sweet lemon”. In the Sephardic song repertoire, “Una matica de ruda” is known in two different versions—one playful and rhythmic, the other simple and lyrical—which together perfectly capture for me the dual emotional character of the song’s lyrics. In my third movement the two different versions serve as first and second themes in a quasi-sonata form. Trío Sefardí was commissioned by Thomas Baron and Mark Cavalenes through grants to Cedille Chicago, NFP, and the work is gratefully dedicated to them as well as the Cavatina Duo—my dear friends Eugenia Moliner and Denis Azabagic. 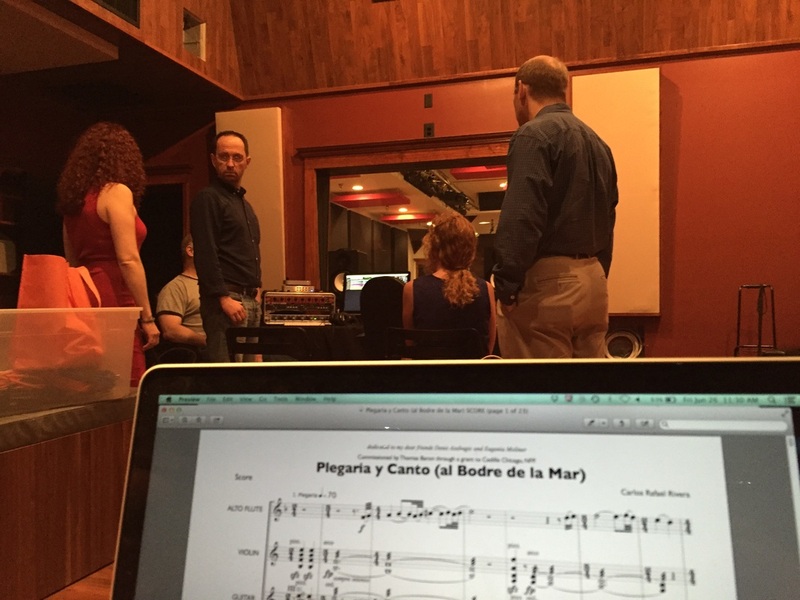 Composing Plegaria y Canto (al Bodre de La Mar) was a fantastic challenge that made me a fan of Sephardic Music. From the many works I was able to study, I became infatuated with the two songs that permeate this piece: "Ven Kerida," and "La Tuya Gracia y Hermosura." Throughout the writing process, I had a recurring vision of a proud, helpless, soul approaching the edge of the coastal town of Borriana in Eastern Spain, pleading her misery as an affront to the Ocean. After a silence, she hears a song. She joins in, perhaps comforted, and tells her story. Estira la tuya pierna um poko m'arrimare. Three pieces inspired by love songs and relationships. Each movement represents a different aspect of these connections - be it an emotion condition, psychological state or the poetry associated with the lyrics. The through-composed portions of this musical composition are meant to be perceived as an expansion and development of these ideas in a programmatic, story-telling way. The first movement is a song about a young woman who loses her innocence when deceived by a scoundrel – her spirit is lifted while looking for justice through God’s work. The second movement is a song about letting go of an old love - and meeting a new one. It is that in-between-place where feelings are still raw and unsettled. The music goes back and forth between those different worlds of emotions like a roller coaster. The third and final movement is a humorous depiction of a couple. Upon hearing the song I visualized a bickering older couple, founders of a vivacious and audible family who enjoy gathering around the house - a little too often. They contribute to a somewhat chaotic, albeit party atmosphere. The piece was constructed based on the lyrics, which provided the following scenario: Husband sits and rests comfortably. Too lazy to get up, he nags and requests that his wife bring him some water. Midway through the piece, a flute cadenza sets the tone - quite irritated one, by the way, representing the wife’s voice. Displeased by the constant amount of work and requests she gets from him and everyone else, she is met by a sorrowful and apologetic guitar cadenza (husband) who seems to promise they’ll be more loving and caring. Everyone's happy and the family celebrations resume in a fun, lively and even more exciting ways than before. The extraordinary Cavatina Duo (Eugenia Moliner, flute and Denis Azabagic, guitar) and the enterprising Cedille Records commissioned me, along with 3 other composers, to write a chamber work that is based on Sephardic folk music. With funds generously provided by Mark Cavalenes, in memoriam to his son, Michael Cavalenes, they asked me to write a piece for flute, guitar and string quartet. Love Dreams of the Exile is the result. The three movements are stream-of-conscious meditations on Sephardic folk tunes. Besides being a rich musical inspiration, Sephardic folk music also often has intense and surprisingly dark lyrics. These particular songs are all about love, just out of grasp – searching, rejection and loss. In each of the three movements, the lyrics suggested a certain dramatic background to my music. In “Yo bolí”, the singer sings, tinged with a kind of sad hope, “I flew from branch to branch to catch up with a pretty bride. With your permission, good mother, I am going to find happiness”. The second movement is based on the ballad, “Una pastora yo amí”. A young man expresses his love to a beautiful young shepherdess whom he has loved since childhood, she answers “You’re too young for love”, chooses another, and he continues to love her even as she forgets him. In the middle of the movement, there appears a passage from another folk song, “Scalerica de oro”, a happy wedding celebration song, that appears here in muted strings as a distant mirage. The final movement centers around “Tu madre cuando te parió”, in which a woman tells a man to go away because he has been unfaithful and has destroyed her wish to live – “Wait for another burning love, As for me, you are dead”. Her raging anger is mixed with irrepressible tenderness and nostalgia. The folk song source of each movement is quoted in the beginning of the first, in the middle of the second and at the end of the last.